This illo about my cute chubby lovely and tall baby. He's wearing 2T size at 9 month old, his pants are too long because 2T is done for the proportions of a child, not for a diaper wearing kewpie. I'm kinda fed up with people looking at my baby and saying : "oh he's so BIG"( if not HUGE). Well, thanks people, this baby is beginning to talk and perfectly understands when you make such statement. He's strong, but I'm 5'8" and his father is a rugby player. He will never be thick slim. It's OK by me. I'm fed up oh so fed up with the "be sick slim" dictatorship. If I have anything to say about 2008 it will be that I don't want to hear the word "diet". Never. For a whole year. What a relief! A chaque fois que je rencontre quelqu'un j'entends "Oh le GROS bebe". 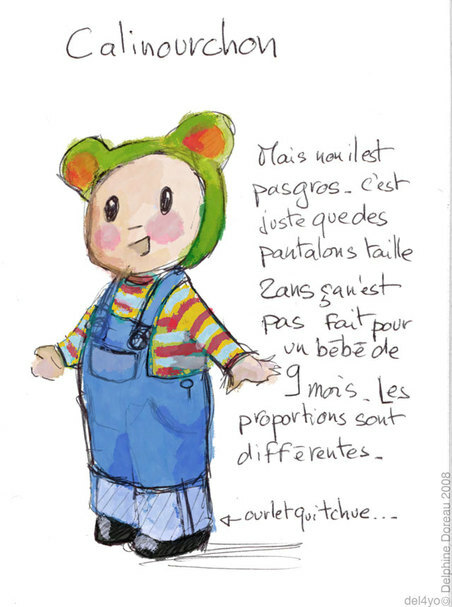 Ben du calme les gens hein, il est bilingue ce bebe, et comprend tres bien ce qu'on lui raconte, et ca ne lui fait pas plaisir. J'y vais tout de suite du " Tu es parfaitement de la bonne taille pour moi", histoire de calmer le jeu, et j'en ai un peu marre, la encore une fois, de la dictature du poids. Il y a des gens qui ne seront jamais minces. Il y a des gars carres et muscles, des filles girondes, et moi ca me va tres tres bien. Donc si j'ai un truc a dire pour 2008 c'est que je ne veux pas entendre le mot "regime". Jamais. Pour toute une annee. Voila! Et vous. Il y a-t-il un mot dont vous avez marre ? Ha non pas chocolat. Cerise? Aspirateur?